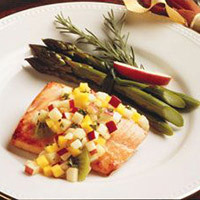 Fish is marinated in a delicious apple-ginger sauce. Served alongside a simple fruit relish. Wash fish and cut into four pieces. Combine apple cider, garlic, and 1/2 teaspoon ginger. Place cider mixture and fish in airtight container or plastic bag and refrigerate for one hour. While fish is marinating, prepare Apple Relish. In small bowl, combine apples, mangos, kiwi, sweet and sour sauce, parsley, and ginger; cover and refrigerate. Grill or broil fish until fish flakes and is done, around 10 to 15 minutes. Serve hot with relish on the side.